For my 100th post on this blog about life in France, I’ve decided to share 100 things to eat, drink and simply enjoy in my adopted land. Some are personal favorites, others classics of French cuisine that everyone should try at least once. Le pain au chocolat. Don’t be misled by the name – there is no bread, just delightfully dark squishy chocolate tucked into a croissant-style bun. Le pain aux raisins. Still no bread, but a twist: the pastry spirals around in a circle interlaced with custard and raisins, sometimes sprinkled with sugar. La confiture. Jam. Nothing like a bit of Bonne Maman on your croissant. Le beurre. Doux (unsalted) or demi-sel (lightly salted). They don’t often serve it with bread in France, but sometimes eat it with cheese to soften the too-strong taste. Un petit noir. An espresso. Also known here as ‘un express’. Le chocolat. Perfect accompaniment to le petit noir. The French are not chocolate snobs as long as it’s dark. Le pain au levain. Sourdough. My favorite bread. Les profiteroles. Choux pastry filled with ice cream, topped with chocolate sauce and whipped cream. Holds a special place in my heart as it was my late mom’s favorite dessert. Les macarons. These double-decker meringue sandwiches have become so trendy you can get them everywhere. Ladurée is the most famous. La tarte au citron. A tangy dessert favorite of mine. With or sans méringue. La méringue. Okay, so it’s nothing but egg whites and sugar. These chewy clouds make a wonderful base for a fruity dessert. Le saucisson sec. A dry cured or smoked sausage, of which there are hundreds of kinds in this country. I like it with peppercorns or pistachio. Sliced on a wooden board and served with your favorite apéro. Le foie gras. You’re free to give this a miss if you can’t abide the idea of force feeding geese but France is the place to sample goose or duck liver pâté. Wonderful with brioche bread, onion chutney and a sweeter white wine. Le pâté. A nice slab of pâté (my favorite is la crème forestière) with pickles on a good bread makes a great sandwich. La saucisse de Toulouse. A thick pork sausage named for the southern city from which it originates and traditionally used in cassoulet. La moutarde de Dijon. Smooth or grainy. Is there any other kind? La choucroute. An excellent dish from the German-influenced Alsace region featuring sauerkraut, potatoes and multiple cuts of fresh and smoked pork. Une andouillette. A sausage made of tripe. Not for the faint of heart. My husband loves this dish, but for me the sauce is the best part. Un MacDo. Just because you can have a beer with your burger while people-watching on Les Champs Elysées. Le sandwich. Because baguette. ‘Nuff said. Un pan bagnat. Basically a Niçoise salad on a round bun (tuna, eggs, tomatoes, lettuce). One of the healthier items to take out at the bakery. Une crêpe. To be eaten at the buvette in the park on a chilly fall afternoon. Dripping with chocolate sauce. Un beignet. Oddly, I’ve only ever seen the French eat sugar donuts at the beach. Une tarte tatin. An upside-down tarte of caramelized apples. Enjoy warm with a scoop of vanilla ice cream. Un demi. My standard order of draft beer (25 cl). Unless I’m thirsty, in which case it’s une pression (half a liter). Le gigot d’agneau. French leg of lamb. Studded with garlic cloves, sprinkled with coarse salt and rosemary, roasted for Sunday lunch. Les cornichons. Pickles. Thick or thin but never sweet. Le camembert. The stinkiest of French cheeses. The most authentic has the ‘AOP’ label, is made from raw milk, ‘moulé à la louche’ and from Normandie. La vache qui rit. Okay, it’s processed cheese but the laughing cow has the fun factor. It was a favorite of my daughter’s and a staple of our household when the kids were small. Le Boursin. Le pain, le vin, le Boursin. With pepper please. La cervelle de canuts. A Lyonnaise spreadable specialty of creamy cheese, garlic and chives, served with slabs of pain de campagne (country bread). Le Saint Félicien. A delicate cow’s milk cheese from the Rhône-Alpes region that runs off the plate and lands on your bread like magic. Le Saint Marcellin. The St. Felicien’s feisty little brother. Le Saint Agur. My favorite French blue. Creamier than roquefort but with just enough tang. Le jambon de Paris. Your basic cooked ham. The foundation meat for many a sandwich, croque, quiche, etc. Le jambon de Bayonne. An air-dried salted ham that takes its name from the city in southwest France. La tartiflette. A potato gratin made with Reblochon cheese and lardons. Loaded with calories to fill you up if you’re skiing – and even if you’re not! Un vin chaud. Mulled or hot wine, spicy and red. Not my absolute favorite thing but pretty damn good in the cold. La pizza. Who said pizza was Italian? Thin-crusted and richly topped, often with an egg, and available just about everywhere in France (but don’t expect delivery unless you’re in a big city). Les blettes. Also known as bettes. Apologies but we had to talk green vegetables at some point. Similar to Swiss chard, the white ‘cotes’ are lovely and nutty and often enjoyed au gratin in France. Les cardons. Another odd veggie considered as something of a delicacy. Looks like celery, tastes like artichoke and often eaten in white sauce around Christmas. Les salsifis. The weirdest vegetable I have ever eaten. A white root served in a white sauce. Must confess I just don’t get what all the fuss is about! Les pralines. Sugar-coated nuts. What’s not to like? 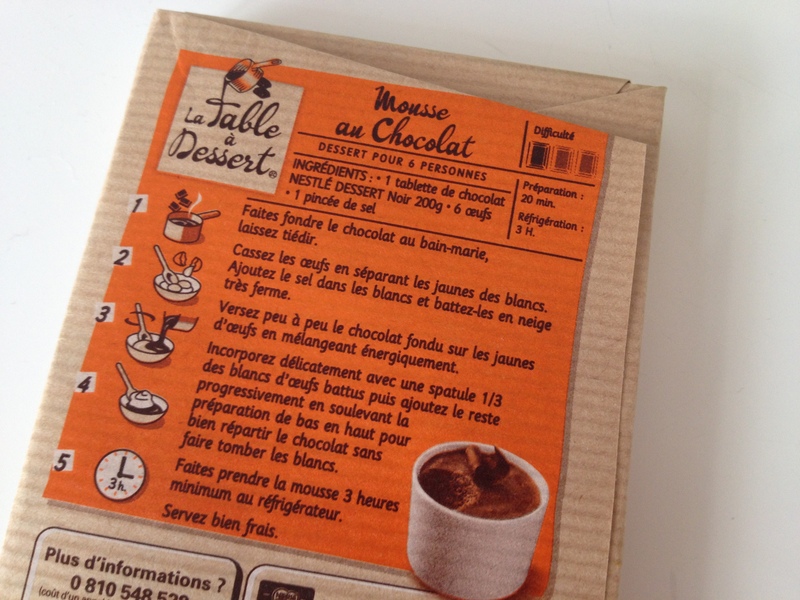 La mousse au chocolat. So good. Only 3 ingredients! Le croque monsieur / madame. Or the Dead Guy as my brother calls it. The classic melt. Madame has an egg on top. La soupe au choux. Cabbage soup. Also the name of a popular detox diet and a comedy classic film with Louis de Funès. La crême brulée. My all-time favorite dessert (next to cheesecake, which is decidedly not French). Thick vanilla custard with a burnt sugar top. La crême caramel. The classic custard dessert with a soft caramel top. La crème de marron. A sweet chestnut purée topping or ingredient for desserts. Lovely with yogurt or fromage blanc. Les marrons glacés. Iced chestnuts. My son loves these. You need a sweet tooth. Une glace. The best place to enjoy an ice cream in France? At the cinema, bien sûr! La buche de Noël. The traditional Yule log, with a great many gourmet twists – glacé, café, chataigne…. Le Calvados. Apple brandy, the Normandy digestif par excellence. La barbe à papa. My husband hates this stuff. Candy floss, spun sugar, white or pink. Transforms your children into sticky monsters at the park. Une omelette. Ain’t eggs wonderful? Especially when cooked to perfection on an omelet pan with globs of runny cheese inside. Des épinards à la crème. Talk about a spoon full of sugar! The French can add cream to anything and it will be delicious. Personally, I prefer my spinach with a knob of butter, salt, shallots and pine nuts. Un citron pressé. Freshly squeezed lemon juice, served in a tall glass with plenty of ice and sugar. Surely the healthiest option while sitting on a café terrace watching the world go by? Le goûter. A.k.a le quatre heures. The after-school snack is very important in French culture because the evening meal is never served before 8 pm, and the kids have very long school days. I know many fully grown French men and women who have never outgrown their goûter. Une quiche. Okay we all know Lorraine, but what about her variants? With goat’s cheese and sun-dried tomatoes, or spinach and ricotta. L’apéro. Cocktail hour à la française. Drink, eat, be merry! Le caramel au beurre salé. This is a drug to me. No translation required. Le pied de porc. Pig’s trotters. It’s said that nothing in the pig goes to waste. Here’s proof. Le lapin. Eat Peter Rabbit, you say? Forget the Easter bunny. If you like white meat, you’ll love it. Le magret de canard. Duck breast, a dark meat readily available in most French supermarkets and easy to prepare (although you need a fan). Makes a nice change from beef. Le tablier des sapeurs. Another tripe specialty from Lyon. Basically they throw nothing away. Une salade Lyonnaise. A safe option in Lyon for the less adventurous. Bacon and eggs on a salad. Une salade Niçoise. Tuna, hard boiled eggs, green beans, tomatoes, potatoes. Anchovies optional. Oh, and a few salad leaves if you insist! Une salade au chevre chaud. Melt goat’s cheese on toast under the broiler and serve on salad leaves. Presto! Les lentilles à la crème. Sure, add bacon and cream to anything and it’ll taste good! Les asperges blanches. The French prefer the big fat white asparagus, which they often eat lukewarm with a cream sauce like Gribiche. La pissaladière. A pizza variant from Nice. Onions, olives, garlic, anchovies. La tarte au myrtilles. You cannot get fresh blueberries easily in France. They’re expensive and often moldy. The best bet is preserves, which are wonderful served in a buttery pie shell. Un kébab. The kebab is popular French street food, although most of the meat comes from Germany. Un couscous. Given the large North African population in France, it’s not surprising that this dish has a lot of fans. Traditionally prepared with merguez (spicy beef sausages), lamb, chicken, steamed veg, chick peas and mounds of soft semolina. Gorgeous. Un verre de blanc. You see people at the markets and food halls sipping white wine quite early in the morning. Why wait for l’apéro? La poule de Bresse. The chicken with a pedigree from Bresse, in eastern France. The ‘artistocrat of modern poultry’, it has blue legs, if not blue blood. Une tisane / infusion. A herbal tea traditionally consumed in the evening, on a cold day or anytime one feels the need for a healthy infusion. Chamomile for relaxation, verbena, mint and fennel for digestion, red vine for circulation – whatever ails you, there’s a tisane for it. Medicinal herbs also sold in pharmacies. Un gratin de courge. Let’s face it – anything mixed with cheese and broiled is good. For some reason, the French are big fans of squash done this way. The secret ingredient: nutmeg. Les moules frites. Another French bistro classic. I do love mussels, especially the garlicky broth – but they are rather a lot of work to eat. Les huitres. Okay, this another cheat as I don’t eat these either (how many have you counted so far?). But those who love oysters swear by them. With lemon, shallots and a glass of white wine. La tartare de boeuf. One of my husband’s favorite dishes. Only to be ordered in restaurants where you can be absolutely sure of the freshness of the meat. They put a raw egg on top, just in case you weren’t already worried about salmonella. La blanquette de veau. As its name suggests, a white dish with a fine sauce. Neither the veal nor the onions are browned. Served with rice. La raie au beurre noire. Skate fish in a black butter sauce with capers. I love the texture of this fish. Les quenelles. Another specialty of Lyon, la quenelle is a sort of dumpling made of eggs and fish, poached in white sauce until it swells, then browned under the broiler. Un kir. My default aperitif when neither beer nor champagne are on offer. White wine blushed with any kind of crême liqueur – cassis, mûre, raspberry, peach. Don’t waste good wine on it. Unless you have it with champagne, in which case it is a kir royale. Le champagne. 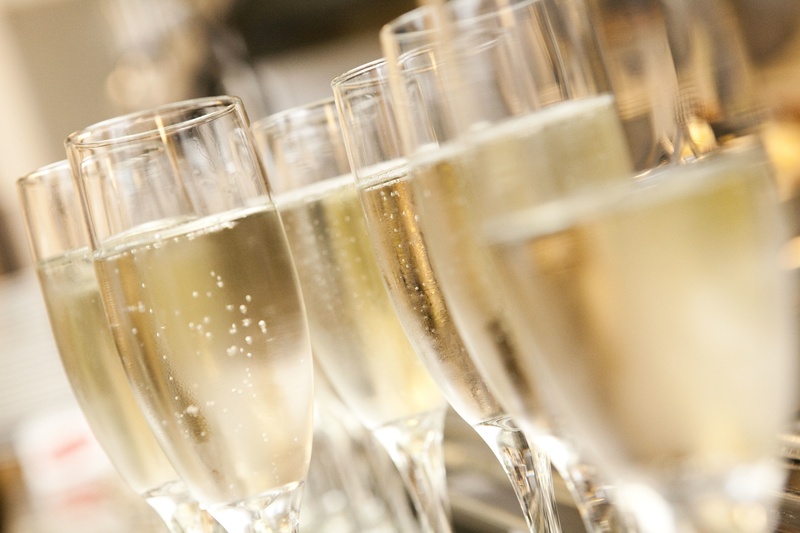 There are no rules with champagne in France – you can drink it before, during or after. A fitting conclusion to a special meal – and this list. Santé! I’ve probably missed a few…what are your favorite French treats?